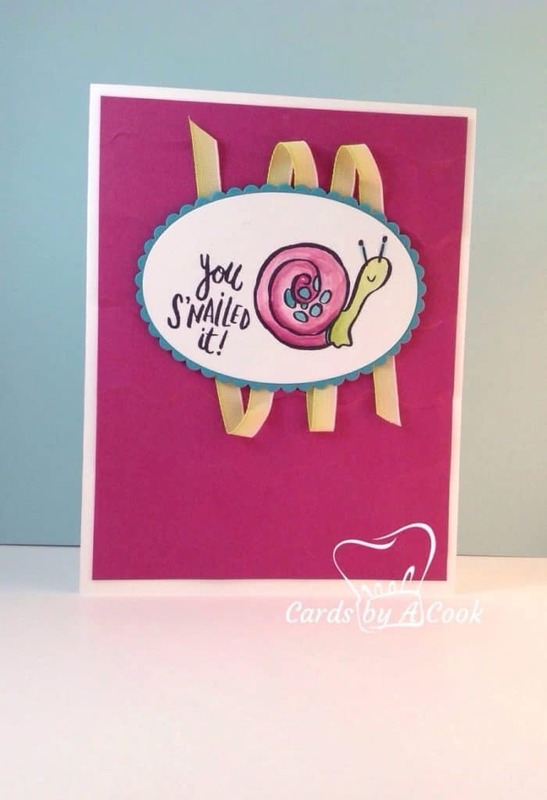 Let someone know they did a great job by sending them this cute snail card. The Quirky Critters snail is suitable for a small accomplishment or a big celebration. This example uses melon mambo for a distinctly girl card- especially with the ruffled embossing folder background- but the stamp itself could easily be used for a more masculine card. I love this colour combo-melon mambo with lemon lime twist and a touch of tempting turquoise. The lemon lime twist ombré ribbon adds a touch of whimsy and is easy to add. Run a couple strips of fast fuse perpendicular to how you want the ribbon to go. Place the ribbon back and forth and cut. The hardest part is trying not to do it perfectly and to just try it. The ribbon should lift off if you need to try a few times until you like how it looks. Like the Quirky Critters? See a belated birthday card made with the same set here. The special whale Quirky Critters image makes a pretty “just because” card or as I like to say a “Cheer you up” card as shown here. Did you forget a birthday? Life is busy. Sometimes despite our best intentions we all forget birthdays. Instead of thinking it’s too late, send a card anyway! 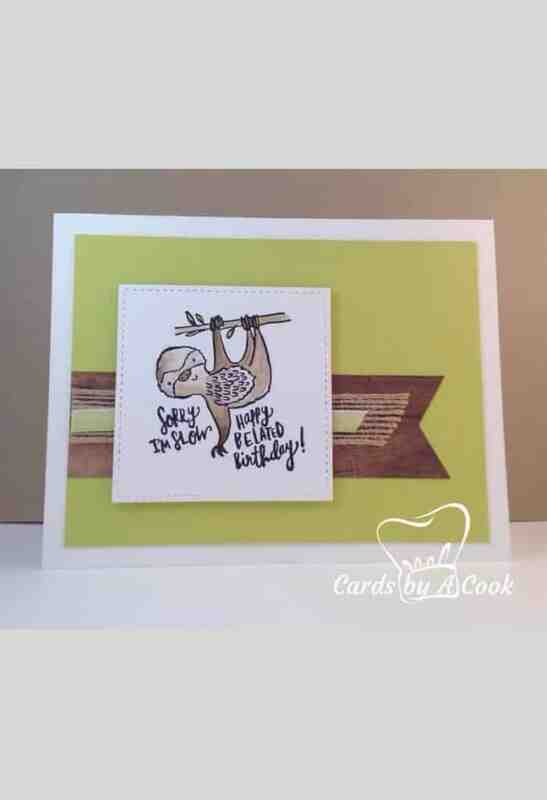 The Quirky Critters set is perfect for a belated birthday card. The sloth can be used for any birthday..young, old, boy, girls …..sloths might be slow but there enjoyed by many. The puns in in the Quirky Critters set are light hearted and fun. I coloured the cute sloth with Stampin Up watercolour pencils and a blender pen. Add a bit of colour and blend. Easy. The hardest part is not overdoing it. If you go over the paper too much with the blender pen it will start to pill. White shimmer paper holds up better if you’re having trouble. Remember that less is more. Leaving some light areas give dimension and some shading. Are you looking for a creative outlet but don't have as much time as you'd like to pursue personal interests? I've been creating and designing cards for over 20 years and have been an active Stampin' Up! demonstrator for 7 years. I launched this website because I understand what its like to want to relax by being creative but become frustrated when my time was spent looking for ideas instead. My card recipes are designed to save you time so you can recharge and enjoy papercrafting.